Ann Evers is everybody's sweetheart in PSST, always positive, supportive and upbeat! She is an excellent portrait artist but shares her paintings only with her family, never for sale. Ann works about equally in oil and pastel, but she is a tremendous supporter of the pastel medium and PSST. She believes it is essential to challenge oneself with continued learning and experimentation. 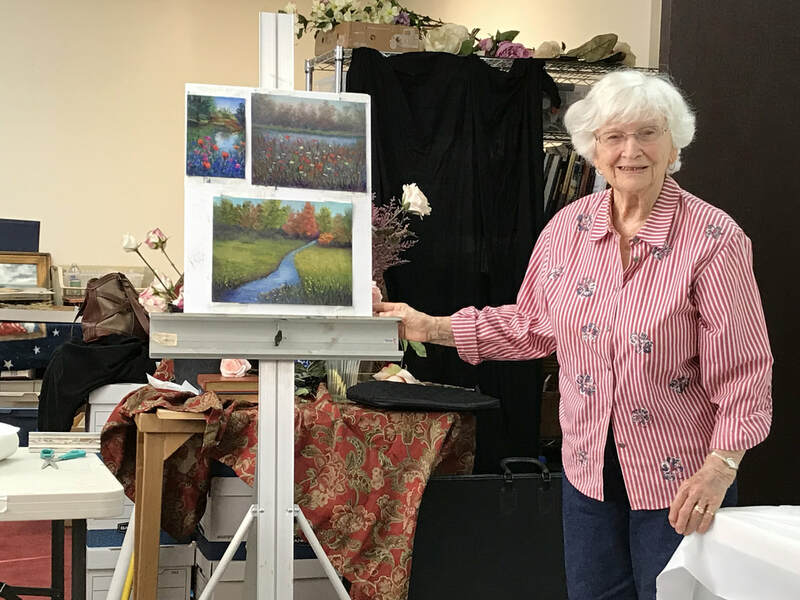 This photo shows Ann at a PSST critique session, explaining how she used a new technique in her landscapes. ​PSST: How did you get started as an artist? ANN EVERS: When I first started painting, I was about sixty years old. We had moved to Lake Livingston, Texas. There was a little shop down the road where I learned to put paint on canvas, but Helen Van Wyk taught me to paint. ​She came on Channel 8, on Tuesdays for 30 minutes. She didn't complete a painting, but she always taught you a principal. She was a Fine Art teacher. I ordered all of her books and VHS tapes. I had a VHS tape, Painting Children in Oil, and before I started to paint a portrait, I always watched that tape. PSST: Have you been involved in art leagues and competitions, and did you grow from your experiences? ANN EVERS: I started painting around 1990; I joined the Livingston Art League soon after. I started with paintings in oils. 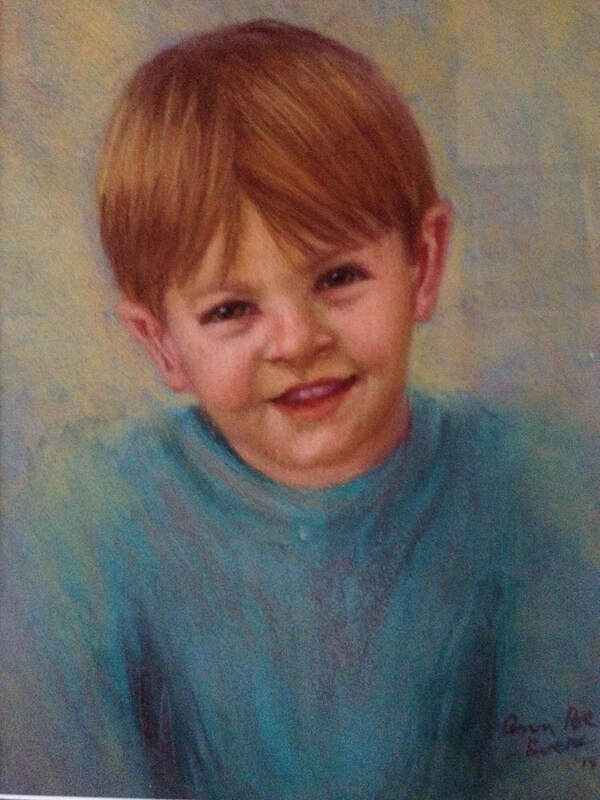 After I joined Livingston Art League, one day Tina Szajko demonstrated painting an Indian boy in pastel. I went to the Texas Art Supply and bought an art book, with a picture of an Indian girl (to follow the lesson), as well as some pastels. I painted that girl and, without knowing better, I entered the painting in the Livingston Art Show. It won the People’s Choice award. 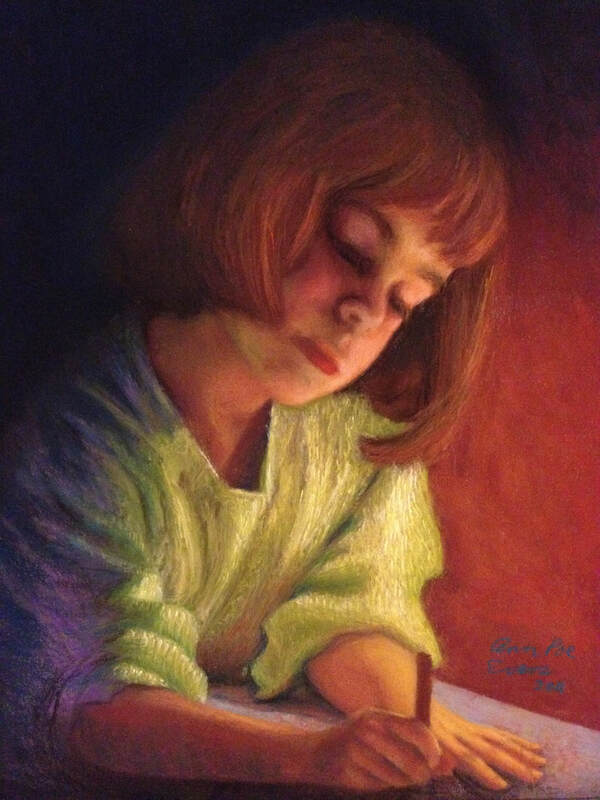 Over the years, I won first place awards for my portraits in Livingston Art League, and then I entered them in the Lone Star Art Guild Convention (annual award-winners competition). I won first, second, and third place awards for them there, in my category. 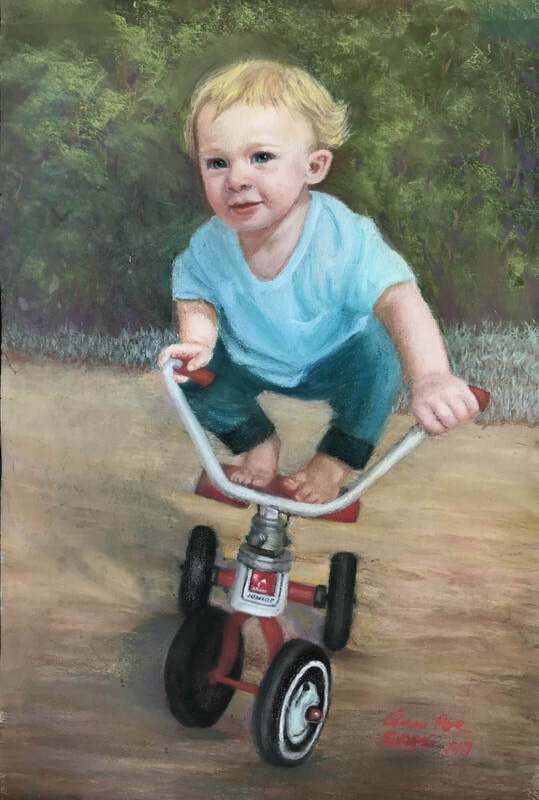 Recently, I entered Will on Wheels in the Art of the Pastel 2018. I don't expect to win anything, but it is nice to have been accepted for that national show. PSST: Continual learning is important. Do you participate in critique groups or workshops? Do you have a favorite workshop instructor or book that you would like to recommend and why? 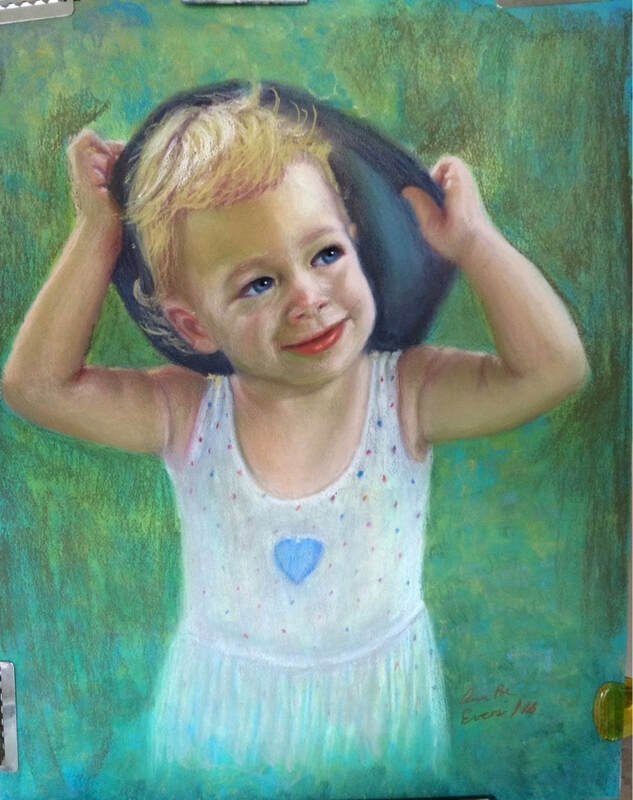 ANN EVERS: When I started painting portraits of my grandchildren in pastel, I ordered all of Daniel Greene's DVDS. I have enough books and DVDs to start a Library, but that is how I learned. After Linda Dellandre taught us how to make pastel sticks, I have made more pastels and will continue to do so. It feels good to make your own, although I do have plenty. I started out using Nu-pastels, and it has been hard to change to soft ones. I still use them for portraits, but I find it easy to use soft pastels for landscapes. Recently, I have been experimenting with underpaintings for landscapes. I enjoyed painting the one with my own pastels. They were nice and soft and went on smoothly. I also have Derwent Inktense Blocks, Art Graf and watercolor, for underpainting. When I get started on something I tend to go overboard. I like trying new things and challenging myself. I enjoy the Critique Group, it is so good to have a group to critique your work and to see what others are doing. It is also a good social time. It is good to get to know your fellow artist. The workshops after our meetings are good too. I am looking forward to the one with Linda Dellandre. You can learn a lot from her. PSST: Your portraits are full of life and love. Who are your favorite subjects for portraiture? ANN EVERS: I like to paint things that have an emotional interest to me. I also like a challenge. The first is of my granddaughter, Laura, around eight years at the time. I took the photo for this painting when she was visiting me at Lake Livingston. She may be my next portrait artist. Will on Wheels will be the the PSST exhibition Art of the Pastel 2018. The next one is my granddaughter, Amanda, also about three at the time.The last one is of my Grandson, Dustin, three years old. In addition to these, I took the photo for this other painting from my porch when we lived at Lake Livingston. My son, Bud, is bringing the boat in and my Son, Bill, is leaning against the post waiting for him. This is an oil painting.